Thirty-three years and over ten million copies later...the classic story continues. Yossarian returns -- older, if not wiser -- to face a new foe. An instant classic when published in 1961, Joseph Heller's Catch-22 still ranks among the funniest -- and most serious -- novels ever written about war. Now Heller has dared to write the sequel to his 10-million copy bestseller, using many of Catch-22's characters to deftly satirize the realities and the myths of America in the half century since they fought World War II. In Closing Time, a comic masterpiece in its own right, Heller spears the inflated balloons of our national consciousness -- the absurdity of our politics, the decline of society and our great cities, the greed and hypocrisy of our business and culture -- with the same ferocious humor that he used against the conventional view of warfare. Back again are characters familiar from Catch-22, including Yossarian and Milo Minderbinder, the chaplain, and little Sammy Singer, as they come to the end of their lives and the end of the century -- all linked, this time, in uneasy peace and old age...fighting not the Germans, but The End. Outrageously funny and totally serious, and as brilliant and successful as Catch-22 itself, Closing Time is a fun-house mirror that captures, at once grotesquely and accurately, the truth about ourselves. 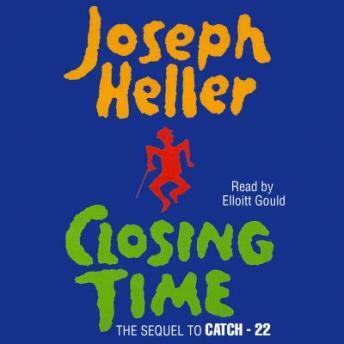 It is enjoyable to listen to Elliott Gould read the prose of Joseph Heller, particularly as it wraps in baffling circles of paranoia and espionage, and as Milo discusses the potential of the "M&M E&A Sup-Supersonic Invisible and Noiseless Defensive Second-Strike Offensive Attack Bomber". On the other hand, abridged audiobooks are dumb. Sorry.